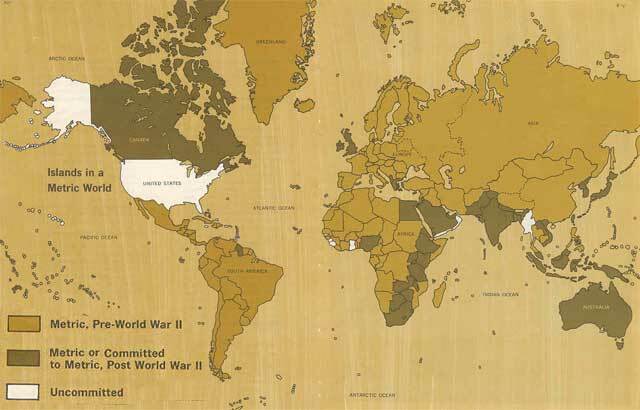 What’s the actual base of the oft-repeated claim that besides the US only Liberia and Myanmar had not officially/fully/completely/… adopted the metric system? For which definition of “not metric” is it or was it true, if any? Many sources also cite Liberia and Myanmar as the only other countries not to have done so. According to the US Central Intelligence Agency’s Factbook (2007), the International System of Units has been adopted as the official system of weights and measures by all nations in the world except for Myanmar (Burma), Liberia and the United States,[…] while the NIST has identified the United States as the only industrialised country where the metric system is not the predominant system of units. Note: At this time, only three countries – Burma, Liberia, and the US – have not adopted the International System of Units (SI, or metric system) as their official system of weights and measures. Although use of the metric system has been sanctioned by law in the US since 1866, it has been slow in displacing the American adaptation of the British Imperial System known as the US Customary System. The US is the only industrialized nation that does not mainly use the metric system in its commercial and standards activities, but there is increasing acceptance in science, medicine, government, and many sectors of industry. Only three nations do not use the metric system today: Myanmar, Liberia and the United States. But calling America a nonmetric nation is somewhat of a misnomer. The United States has given more than an inch even though it might not have gone the whole nine yards. Still, America is the only industrialized nation in the world that does not conduct business in metric weights and measures. Many, many other references abound. This is an oft-repeated claim, e.g. it’s an anecdotal “fact” often told by teachers introducing the metric system to (US) students. The statement sounds unfounded to me and is almost always used to shame Americans by associating them with two exemplary “backwards” countries. The claim has been around a while, at least since the 1970s when the UK and Commonwealth countries formally converted, but the political and commercial situation in many countries (including those notorious three) has changed since, e.g. significantly in Myanmar in 2011. Some sources now identify Liberia as metric, and the government of Myanmar has stated that the country would metricate with a goal of completion by 2019. However, reports published since 2007 hold this is no longer true of Myanmar or Liberia. An Agence France-Presse report from 2010 stated that Sierra Leone had passed a law to replace the imperial system with the metric system thereby aligning its system of measurement with that used by its Mano River Union (MRU) neighbours Guinea and Liberia. [According to the Agence France-Presse report (2010) Liberia was metric, but Sierra Leone was not metric—a statement that conflicted with the CIA statement (2007).] Reports from Myanmar suggest that the country is also planning to adopt the metric system. The US have signed the Metre Convention early on and metric units are legal for almost all purposes, although sometimes dual-labeling is required and customary-only is frequently encountered (e.g. on road signs). Many “metric” countries, most notatbly the UK, have some remnants of traditional local or colonial systems of measurement. US dominance in some industries or markets has also forced their English units into places where they haven’t been used before, e.g. inch-based typographic points or screens nominally sized in inches per diagonal. As of today [September 2011] there are seven non-metric countries in the world: Liberia, Myanmar, United States, Independent State of Samoa, Federated States of Micronesia, Palau, and Marshall Islands. In the discussions about metrication it is widely assumed that there are only three non-metric countries (Liberia, Myanmar, and the United States), an unfounded assertion that has taken a life of its own and has been repeated thousands of times for more than a decade by academics and persons interested in the history of the metric system (me included). You also seem to be asking whether metrication has completely eradicated non-metric units in countries outside these seven. The answer is no: there is no country in the world where non-metric units are completely banned from official use. All UN member states are part of the International Civil Aviation Organization, which currently requires all operators to be familiar with knots, nautical miles, and feet. People like to think of a country as being “metric” or “non-metric,” but deciding which label to apply is difficult because it's not an either/or condition that switches on a particular date. For example, it's often stated that the U.S. is a non-metric country. But while the U.S. is non-metric in some areas, such as road signs, speedometers, and weather reports, it's metric in many other areas, such as food quantity and nutrition labels, and car and machinery manufacturing, and athletes run 100-meter races. Conversely, Canada is generally considered to be metric, and its road signs indeed are, yet it uses yards in its football games and typically uses feet and inches and pounds when describing a person's height and weight. Similarly, it's usually stated that the UK is a metric country, but its road signs are non-metric, just like the U.S. So, beware of reading too much into the “metric” and “non-metric” labels when applied to entire countries. Even the question of whether a country is “officially” metric is harder to answer than you'd think. For example, officially, the U.S. has been metric since 1866, 1893, 1975, or 1988, depending on which official declaration you prefer to cite, and similar uncertainties apply to other countries. Here's a blog with some more examples of non-metric and "soft metric" measurements in Britain. 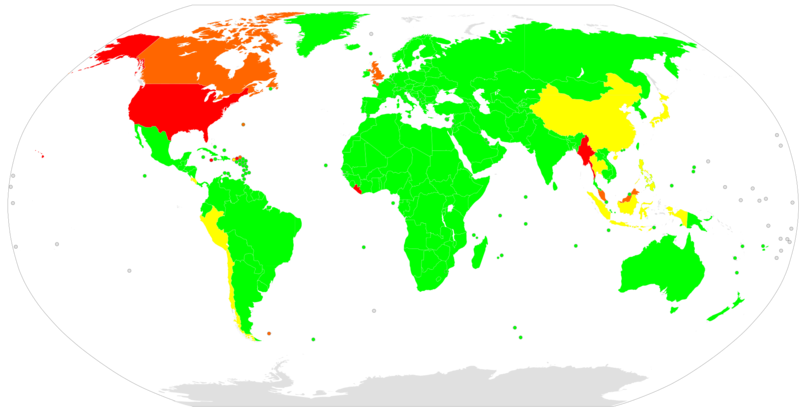 According to a well-sourced wikipedia article, those three countries are the only three that have "some adoption", whereas all the others have "partially complete" adoption (UK, Malaysia, Canada, Jamaica), "almost entirely complete" adoption (8 countries) or "complete" adoption (all the rest of the world). This is also confirmed by one of the wikipedia sources via a little searching. Not the answer you're looking for? Browse other questions tagged united-states commerce . Are antipsychotic drugs vastly overused in the US? Are only 700 out of 480,000 life scientists creationists? Do Imperial units make United States children worse at maths? Does United States have no technology to allow Internet voting in a secure way?